Sonic is a keychain-based LCD game created by Tiger in 1998. The game case is shaped somewhat like a Game Boy Micro and has a keychain attached to it. The game features a standard directional pad and 2 buttons "A" and "B", as well as reset and power toggle buttons. 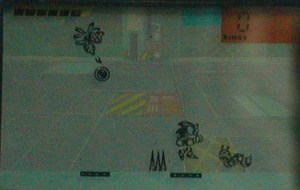 The background of the game seems to be an industrial area, likely Eggman's base, as there are grills on the floor. The game comes in both black and blue casings. This page was last edited on 4 July 2016, at 11:39.